Resonance was a collaborative, group exhibition by two painters, a sculptor, a filmmaker and a musician. Each artist exploring the changing environment of the planet and the concept of pollution. The exhibition was organised and curated by Alexandra Gould, who also contributed four new works to the event. The private view was a success, packed full of people eager to see the new work created on the theme of what is known of our changing planet's climate and how we engage with that information. The energy generated by the capsule exhibition made for a memorable and successful event. The exhibition audience discussed issues they found disturbing and shocking, relating the artwork to their own experiences. Every artist that took part in this event is responsible for delivering a truly meaningful, memorable and interesting art exhibition to Corsham and the wider Wiltshire community. The council reported a steady stream of visitors to the exhibition throughout the 4 weeks. Outreach art workshops were organised and delivered by Rachel Heard and the event created an opportunity for a Wiltshire based talk by the prominent Deep Sea Marine Ecologist Dr. Alan Jamieson at Dyson's head office. The exhibition can be seen for a limited time on the resonance gallery section of this website including the film and music composition. An essay shown below by art writer Katie Ackrill guides the viewer through the influences and inspirations of the exhibiting artists. In 1981 NASA scientist James Hanson published a groundbreaking article, predicting with astounding accuracy the consequences of the greenhouse effect on our planet. In Science Magazine, Hanson stated that by the end of the 21st century we would see shifting climate zones, draught-prone regions, erosion of ice sheets and rising sea levels (ref.1). At that time, the human race was living in a “fossil-fuelled dream”, believing our business, economy and consumerism would always be driven, without consequence, by cheap fossil-fuel energy (ref.2). The idea that we would one day be responsible for dramatic shifts in the Earth’s atmosphere felt incomprehensible to many people, who could not yet identify the effects of climate change in their everyday lives. In his 2012 TED talk Hanson was able to demonstrate that his predictions, which had led to a degree of controversy and censorship just thirty years before, were already coming true (ref.3). At the time of writing, Britain emerges from one of the most intense heat-waves on record, with an uncomfortable certainty that the world is getting warmer. A recent National Geographic review stated that last year the Arctic lost ice equal to the size of Alaska and California combined. Moreover, the number of climate-related disasters has more than tripled since 1980, and populations of certain animal and plant life are diminishing (ref.4). The effects of climate change are real, and as we finally, reluctantly begin to turn our heads toward “the biggest single issue that the human race faces”(ref.5), the whole new problem of plastics pollution has also come to our attention. A term with which many of us have been unacquainted with until very recently, “plastics pollution” refers to the damage we are causing to our natural environments through the improper disposal of plastic products. Since its production took off in the 1950s with the birth of a culture of “throwaway living”, millions of tons of plastic have ended up in the ocean, killing millions of marine animals every year (ref.6). So how do we, the species that bought about these changes, begin to comprehend the damage we have caused? Now that we know the facts and figures, how do we respond to our changing environment? In her pioneering book Playing for Time, Lucy Neal describes the Earth’s story as an unstable and shifting narrative, and looks at our current situation in relation to the two strands of Greek theatre. She ventures that the moment of seeing the truth about climate change dictates whether our story is a comedy or tragedy. If the world wakes up from its denial and sees the truth, there will be time for learning and hope, as in the Greek comedy. However if this moment of recognition comes too late there will not be time to act, and the consequences will be tragic (ref.7). In this analogy it is possible that artists can be “the circuit breakers of tragedy”, speeding up that moment of recognition in time for change and renewal. Indeed, throughout history art has proved a powerful catalyst for change due to its ability to draw our attention to important issues; most significantly those defined by anxiety and uncertainty. We live in a moment where it is now socially unacceptable to deny pollution and climate change, and yet the causes are so ingrained within our way of living that it is easy to suppress the unease about what could happen, and what needs to be done. For humanity to fully acknowledge the impact of its past and future actions, science’s facts and figures need to be transformed into emotion through a universal, collective language. Only when we convert what we know into what we can feel will we truly be moved to action. Through the work of five artists Resonance begins dialogues about the effects of human activity on our planet. Alexandra Gould, Daniel Gould, Rachel Heard, Stuart Bruce and Rachel Reid present poignant responses to carbon and plastics pollution, at a moment when the consequences of these problems are becoming increasingly apparent and the window for taking positive action is getting smaller. An alarming new report published in August 2018 warned that a continued lack of response to carbon pollution could take the Earth into a ‘hothouse’ state, in which efforts to reduce emissions would be increasingly futile (ref.8). Meanwhile, a recent article in National Geographic revealed that microplastics have been found everywhere in the ocean that people have looked so far (ref.9). The facts are hard to face, but far from frightening viewers into further denial, the work in this exhibition opens up meaningful conversations through powerful images and sounds, which remind us of the enormity of the decisions we make on a day to day basis. Creating work which resonates with us on an emotional level, the artists enable us to feel more deeply about the cost of our actions on the future of our planet, and the life which depends upon it. Through her skills as a portraitist Alexandra Gould uses the powerful gazes of her subjects to draw out feelings of unease within the viewer. Her portrait of marine ecologist Professor Alan Jamieson confronts us with the blunt gaze of a scientist who understands the full impact of pollution on the deep sea. Meanwhile, innocent victims from the depths of the ocean stare into a troubled future. On the other hand, Rachel Heard’s expressive abstract paintings bring to mind the turmoil of the melting ice caps through expressive, layered mark making. In Final Floe there is a sense of a great tension finally being broken; but even as nature loses its battle, Heard captures its undeniable beauty. As such, she not only poses the overbearing question “When is it too late?”, but reminds us of exactly what it is we have to lose. Whilst Heard’s paintings draw on the beauty of nature, Daniel Gould’s layered images of urban environments pose questions around mankind’s relationship with their planet. His film Decompression juxtaposes images of natural and manmade structures, highlighting the familiarity of hectic, artificial environments. In his Future Fossil series urban images are printed onto discarded materials which are no longer considered environmentally safe, but are still widely used in construction. Rachel Reid’s chosen materials are also essential to the way her work resonates with viewers. The issue of plastics pollution is tackled without reservation, through a series of human and animal-like forms constructed with single use plastics. Confronted by these compelling figures, we are reminded of the effects of the throwaway culture we live in, and are forced to ask ourselves what we are contributing to a suffocating planet. Alongside these poignant visual warnings, Stuart Bruce’s haunting sound piece plunges the listener into an immersive experience. Bruce’s tense, enigmatic composition combines sounds of the arctic landscape, ominous musical tones and manmade intrusions. The juxtaposition of natural sounds with those of cracking plastic bottles and fishing weights result in a piece infused with danger and uncertainty. These five artistic viewpoints come together in an exhibition which does not alone aspire to change the world. The aim is that the work will resonate with viewers, and spark within them a conscious awareness of the ways our world is transforming. Seeing and feeling the effects of our actions, rather than simply knowing them, leads to a clearer understanding and, whether on a large or small scale, opens up avenues for conversations and positive changes. Through visual and audible artistic interpretations, Resonance is a timely endeavour to convert what we know on a superficial level, into an emotional and active response. Katie Ackrill is a Wiltshire-based writer and curator. After completing an MA in Art History in 2014, Ackrill worked at Swindon Museum and Art Gallery for several years, before entering a role as the Visual Arts Coordinator for Pound Arts (Corsham) and Town Hall Arts (Trowbridge) in 2017. An advocate for arts and venues in the region, she writes a blog focusing on art exhibitions in the South West - https://artreviewssouthwest.wordpress.com/. Initial contact between Katie Ackrill, Alexandra Gould and Rachel Heard was made at the Creative Corsham Artists’ Cafe, which encourages local artists to come together at the Pound Arts Centre once a month. 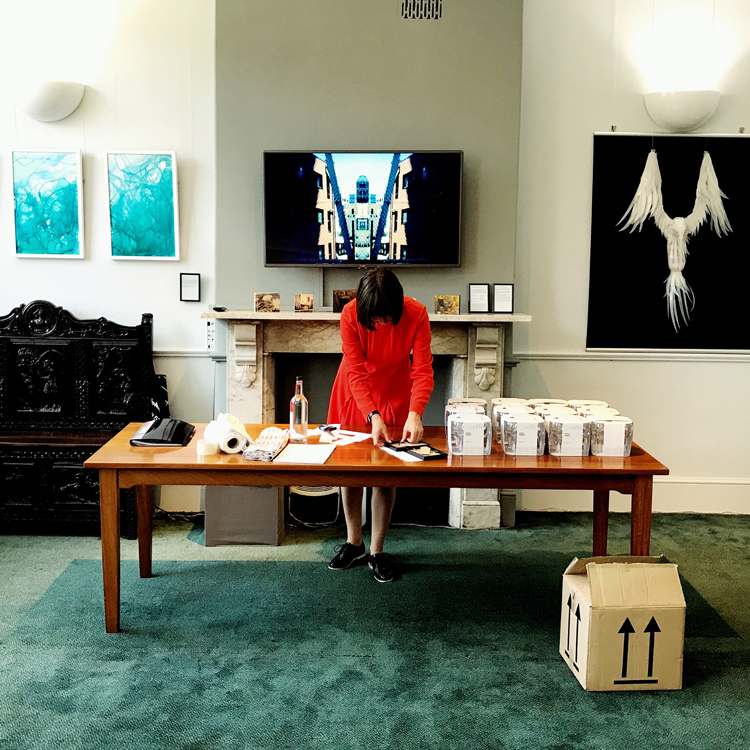 Having expressed enthusiasm toward the Resonance collaboration, Ackrill was invited to contribute a piece of writing for the exhibition which she eagerly accepted.